Each year we organize two to three retreats at El Carmelo Retreat House in Redlands--one to two for the men of the Parish, and one for the women. They are separate retreats--each normally held in the Spring. 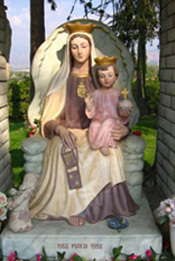 El Carmelo Reteat House in Redlands, California, is operated by the Discalced Carmelite Fathers, the same order as our priests at the parish. We also offer a Men's Retreat in the Fall held at Mater Dolorosa Retreat House in Sierra Madre--run by the Passionist Fathers. Click on the links to the left for more information about these retreats.